The 64GB barrier in system memory is now broken by DDR4 RAM in Intel’s Haswell-E. Watch us tear down that wall. Ticked off you can't run more than 64GB in your PC? We just smashed through that barrier and went all the way to 128GB of system RAM. Humans like to celebrate barriers being broken. The speed of sound. The first 1GHz processor, or 1TB hard drive. So get ready to pop the California sparkling wine, because we just smashed right through the 64GB system RAM barrier. That barrier, if you didn’t know, has vexed consumer computing for years now. Mainstream desktop PCs have all featured four slots for a maximum of 32GB of DDR3 RAM. At the high-end, prosumer PCs doubled that to eight slots for a maximum of 64GB DDR3. With the move last year to DDR4 RAM in Intel’s Haswell-E, we were promised we’d finally break the 64GB mark. That time has come. Last month both Corsair and Kingston announced 128GB memory kits using 16GB DDR4 memory modules. We had to try one out. Here’s what 128GB of DDR4 looks like. If you’re wondering why we’ve been locked in at 64GB for so long, it’s mostly due to the technology and process changes. DDR3 modules topped out at 8GB, in what’s typically called an unbuffered DIMM. You could actually get higher-capacity modules in DDR3, but they were only in registered or buffered DIMM. These memory modules are meant for servers or workstations, which typically cost an arm and a leg and run at much slower speeds, because they sacrifice density for reliability. 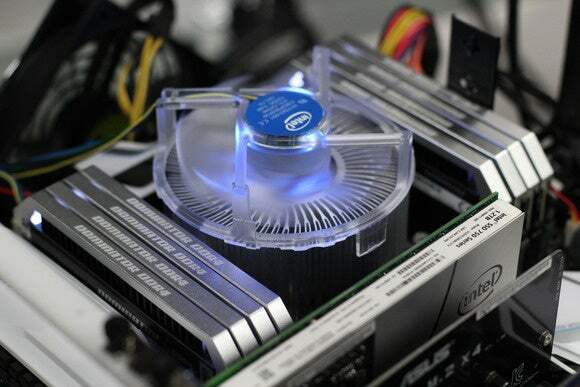 The move to DDR4 last year with Intel’s Haswell-E CPU also promised higher-density chips. While DDR3 maxed out at 8GB, DDR4 now maxes out at 16GB per module. One of the first 128GB DDR4 kits out is Corsair’s Dominator Platinum that’ll set you back $1,980. To break the barrier, we reached out to Corsair for its 128GB kit. The company actually has three speeds: DDR4/2800, DDR4/2666 and DDR4/2400 at the Platinum level. The kit we used was the DDR4/2400 and is comprised of eight 16GB modules. It comes in a matched set with two heatsink fans. The module’s not cheap: The fastest DDR4/2800 set is $2,120, while the two lower-speed kits are $1,980. In true computer tradition though, prices have already begun to fall. Corsair has since released its Vengeance LPX line at the same density and speed for $1,600. Not everyone can get to 128GB of RAM. Obviously you need eight memory slots. You’ll also need a CPU that supports DDR4, but you don’t need a $1,000 Xeon or Core i7-5960X CPU. 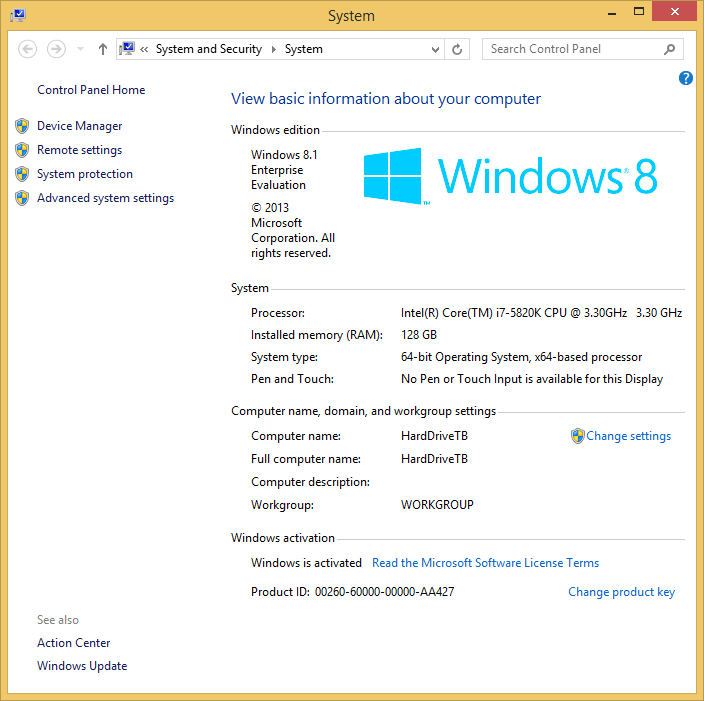 For this particular test I used Intel’s cheapest Haswell-E CPU, a Core i7-5820K. The final ingredient that you’ll need is a motherboard whose BIOS supports 128GB of RAM. When I first plugged the 128GB of RAM into our Asus X99 Deluxe/U3.1 board and threw the switch, it wouldn’t boot. Only after obtaining a beta BIOS from Asus would the board POST. 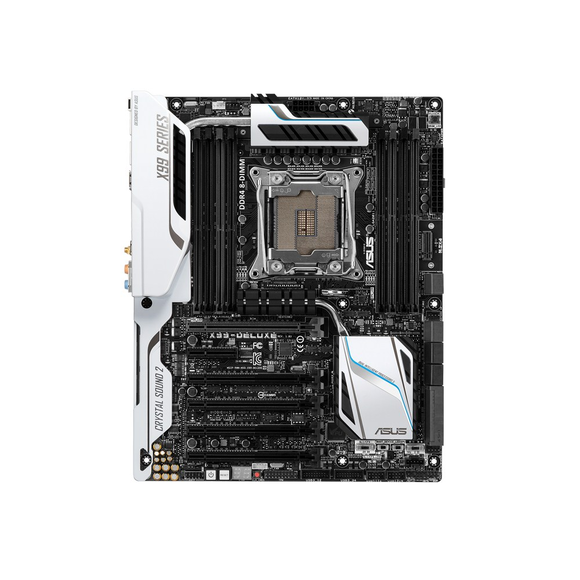 The good news is, I’m told by Asus that it expects to roll out support across its X99 board lineup as we speak. I expect other motherboards to support 128GB of RAM, too, as the modules become more common. Once I updated the board to the latest BIOS, all went as expected without any hitches. The OS I used on our PC was Windows 8.1 Enterprise. If you still don’t believe I got the bottom-feeder Core i7-5820K to work with 128GB of RAM, here’s proof. I’ll admit, I was giddy firing up a PC with 128GB of RAM in it, but once I was booted I experienced a “now what” moment of doubt. Few people need more than 16GB of RAM, and some can even get by with 8. Outside of the 1-percenters who may need 64GB of RAM for extreme photoshop, virtualization or multi-tasking, it’s just not needed. To make use of this glorious amount of hardware, I settled on creating one massive RAM disk. RAM disks use your system’s RAM to simulate a storage “disk.” They’ve been around for years but typically are far smaller due to the constraints of memory. Not everyone needs a RAM disk, but if you need access to temporary storage that puts even the most powerful SSDs to shame, a RAM disk is the way to do it. SSDs: Tremble before the performance of my 100GB RAM disk! I fired up Softperfect RAM disk and dialed in a 100GB RAM disk. Here’s what’s so great about the RAM I had: Even with a 100GB RAM disk, I had 28GB or so of memory left to work with. 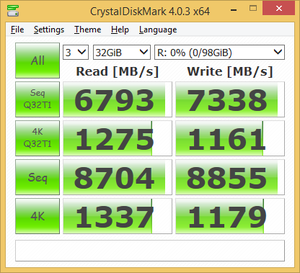 To find out just how fast this RAM disk could be, I ran Crystal Disk Mark. As you can see, the performance puts any SSD to shame. The mighty Intel 750-series SSD, for example, has a sequential read speed of maybe 2.7GBps. The RAM disk was hitting 8.7GBps. RAM disks have one pretty big downside: if there’s a sudden power outage or serious BSOD, kiss goodbye anything you had in the RAM disk that wasn’t previously saved. It’s gone baby, gone. 128GB of DDR4 RAM isn’t for everyone but believe it or not, one day it’ll be the norm. It’s obvious I’m reaching for use cases for this much RAM, but there are people out there who legitimately need this capacity. It’s just not for 99 percent of us. What this really is about, though, is finally breaking through the 64GB barrier. Yes, 128GB of system RAM seems silly, but if you dial back the clock, people used to say that about 16MB of RAM and 1GB of RAM. One day, I can say with confidence, we’ll look back and laugh how silly we were to be in awe of 128GB of RAM—when we’re all running 1TB and counting.